​Glory be to the Most Sacred Heart of Jesus. of the foundation of the Congregation of the Sister Servants of the Most Sacred Heart of Jesus. and prayer for the intentions of the Holy Father) to all who observe the Jubilee Anniversary. between January 1 and December 31, 2019.
at the Shrine of St. John Paul II in Krakow. on the anniversary of her first religious profession. through the intercession of the Most Blessed Virgin Mary. in 1894 in Krakow, Poland. Sr. Ryszarda Wittbrodt and Sr. Mary Joseph Calore met with some of our Lay Associates, the Rays of Merciful Love, at St. Jane de Chantal Catholic Church in Easton, Pennsylvania. Sister Mary Joseph Calore and Sr. Augustine Marie Molnar attended Mount 2000 Retreat, from February 8-10, 2019 in Emmitsburg, Maryland. This annual event is a Eucharistic Retreat for high school students coordinated by the seminarians of Mount St. Mary's Seminary, Emmitsburg, Maryland. Eight hundred students attended the event this year, at which our Sisters were able to host a display table with our brochures and make our charism known. The seminarians were interested in the life of our Father Founder, and several expressed the hope that they can become devoted to our Saint who was also a diocesan priest. ​Our Sisters organized a retreat for girls from January 25-27 at St. Joseph Convent in Munster Township, Portage, Pennsylvania. Twenty-nine young women attended this retreat, which focused on the theme of generosity. The weekend included Holy Mass, Adoration, Conferences, and even the activity of making soap. Our Junior Sisters o​bserved their annual days of retreat and renewal, led by Fr. Nathanael Polinski, OSB of St. Vincent Archabbey, Latrobe, Pennsylvania, joined by the perpetually professed. Our Sisters made a musical recording of hymns under the direction of Sr. Mary Daniel Jackson, SSCJ. Our Sisters gathered for our Province Thanksgiving Dinner at St. Joseph Convent, Munster Township, Portage, Pennsylvania. Our Sisters moved into a new convent location for Bl. Klara Szczesna Convent in Middletown, Pennsylvania. On November 16, 2018 the Most Holy Sacrament took up residence in the house, with Holy Mass by the Pastor, Fr. Edward (Ted) Keating, of Seven Sorrows of the Blessed Virgin Mary Parish in Middletown, Pennsylvania. ​On the First Friday of August, August 3, 2018, Sr. Marietta Therese Hanley, SSCJ, a perpetually professed Sister of the Congregation of Sister Servant of the Most Sacred Heart of Jesus, entered into eternal life at 12:35 am at St. Joseph Convent, Munster Twp., Portage, PA, surrounded by her religious Sisters, family and friends. The vigil for Sister Marietta Therese was held at St. Francis Xavier Church on Tuesday, August 7, led by Fr. Angelo Patti, with prayer throughout the day led by the Sisters and a Chaplet of Mercy led by All Saints Catholic School. S i s t e r Marietta Therese’s funeral Mass took place St. Aloysius Church Cresson, PA on Wednesday August 8 at 11:00 a.m., where, in the presence of the Bishop of Altoona-Johnstown, Most Rev. Mark Bartchak, the Celebrant, Very Reverend John Byrnes, JV, JCL, Homilist Rev. Dennis Carbonaro, nineteen priest concelebrants, Deacon Richard Golden, seminarians, religious, and family and friends, the church was filled to capacity, a tribute to the love and devotion of this Sister. The graveside prayers at St. Francis Xavier Cemetery were offered by Franciscan Friars Fr. Jim Mormon, Tor and Fr. Nathan Malavolti, TOR. ​Mother Amabilis Dȩbicka observed her 65th Anniversary of religious profession. Within those 65 years, Mother has distinguished herself as a faithful and dedicated religious Sister who was entrusted with unique responsibilities in her religious life. Mother was the foremost pioneer for establishing our Congregation in the United States of America, where she served here as first superior, director of novices and later, first provincial superior. God has certainly used Mother’s intrepid spirit, her optimism and warmth with people to further the designs of His Sacred Heart for the benefit of countless souls in the United States and Jamaica. We give thanks to God for the gift we have in our beloved Mother Amabilis. ​Sister Mary Joseph Calore and Sr. Augustine Marie Molnar joined 23 other religious Sisters to assist with the Fiat Camp for the Archdioceses of Baltimore and Washington, held at Mount Saint Mary's University and Seminary, Emmitsburg, MD. Sr. Mary Joseph Calore was a speaker at the event, delivering a lecture on Chapter VI of Pope Francis' Apostolic Exhortation, Gaudium et Exsultate, and Sr. Augustine Marie Molnar assisted with music. Both Sisters participated in group and panel discussions for the 52 young women present, discerning their vocation in life. The event was marked by a visit and Mass by one of the Auxiliary Bishops of Washington, Most Rev. Michael William Fisher as well as by the observance of the Memorial and veneration of the relics of Blessed Stanley Rother, first American-born martyr and alumnus of Mount St. Mary's Seminary. ​Sister Gabriela Strachowska and Sr. Angela Marie Igou with four teachers and adult and teen volunteers organized Camp Logos at Sacred Heart Parish and Academy in Grand Rapids, Michigan for 60 children. ​Sr. Mary Joseph Calore and Sr. Augustine Marie Molnar participated in the Fiat Days/Quo Vadis Discernment week for the Diocese of Allentown, at DeSales University in Center Valley, PA with the theme "Take Courage, Do Not be Afraid (Mt. 14:27)." Over 100 young people participated. Sister Mary Joseph joined the Bishop of Allentown, Most Rev. Alfred A. Schlert, the vocation director, Fr. Mark Searles and religious and seminarians in addressing the parents of those attending. Sr. Augustine Marie Molnar organized a youth choir and assisted with music for the week. 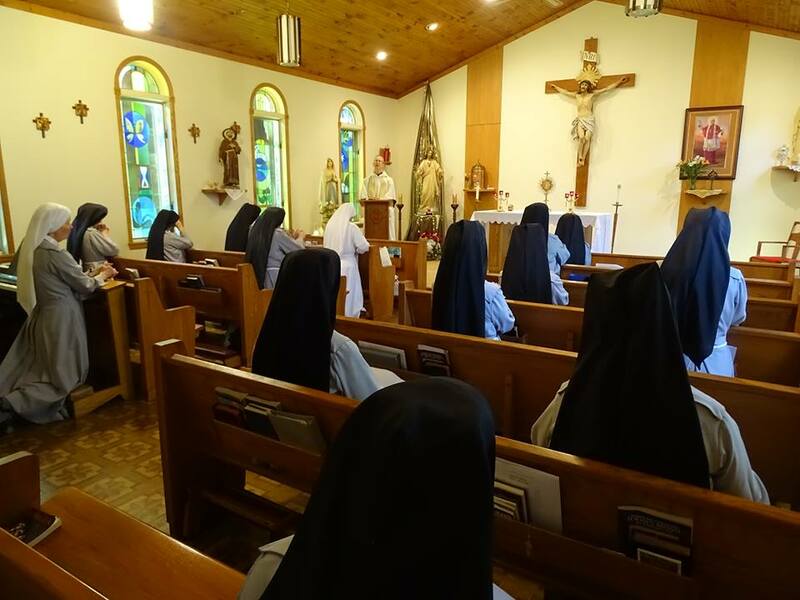 ​The Sisters made their Annual Retreat at St. Joseph Convent, Munster Township, Portage, Pennsylvania, led by the Benedictine monk Fr. Nathanael Polinski, OSB of St. Vincent Archabbey, Latrobe, PA.
​The Solemnity of the Most Sacred Heart of Jesus was celebrated at St. Joseph Convent Chapel in Munster Township, Portage, PA by the celebrant, Fr. Matthew Reese. The Mass was followed by a social and fireworks provided by Fr. Michael Wolfe and Matt & Emily Wolfe and friends of the Sisters. Our Sisters observed our annual Triduum of adoration and evening devotions before the Solemnity of the Most Sacred Heart of Jesus at St. Joseph Convent Chapel, Munster Township, Portage, PA, with homilists, Fr. James Mormon, TOR, Fr. Michael Wolfe, and Fr. Matthew Baum.